Home » News » Why Use Top-Printed Balloons For Your Corporate Event? Have you ever wondered what is possible if you think outside the box? Have you ever needed a balloon decoration but couldn’t do it because the design would hide your company’s logo? CSA Balloons has the solution for you: top-printed balloons. To begin, what is a top-printed balloon? A top-printed balloon is a balloon on which the logo is printed on the top of the balloon. This makes it perfect for certain decorations such as balloon arches. 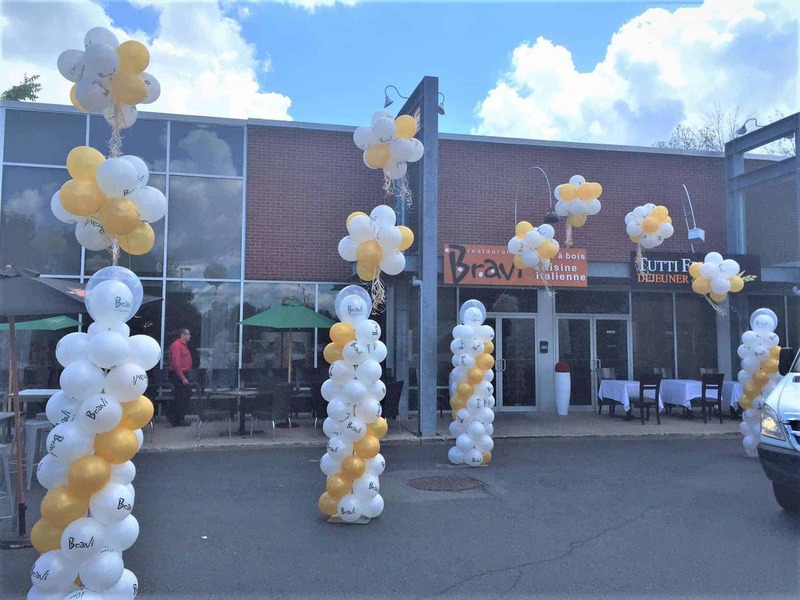 These decorations could be the key to attracting new clients and it takes top-printed balloons to make it happen. 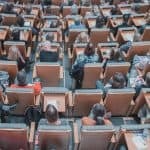 But before we can get into why top-printed balloons are so good for business , we must explain why balloons attract so much attention in general. A balloon is bright colorful and attracts attention like nothing else. Balloons remind everybody of good times and nobody can say that playing around with a balloon is not entertaining. 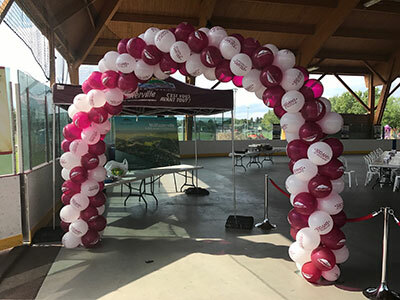 As such having balloons at a corporate event or some such activity is a good way to help your business prosper, even if you must pay for the balloons. Not many balloon printers offer custom top-printed balloons due to the difficulty to print them, CSA Balloons however, does not share these restrictions. Due to their custom made balloon printing machine designed to fix all the problems its predecessors had, they have no problems printing these balloons. Top-printed balloons are a rare thing, however they are very useful. With top printed balloons you can make things that with regular balloons you couldn’t even consider. 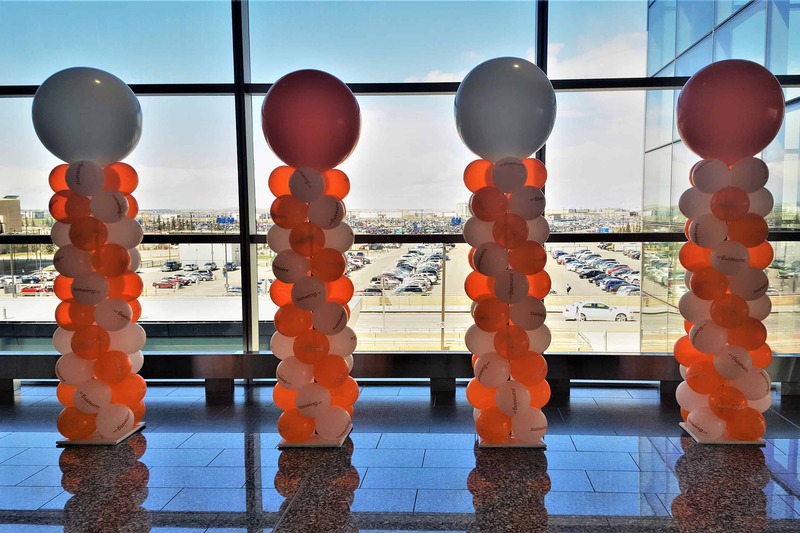 For example balloon columns, you can make a long column of balloons tied together from floor to ceiling while still showing your logo on each and every balloon there. This type of decoration can be very important at a corporate event. This will draw all the attention and as the balloons have your company’s logo on then people will see it everywhere they look. On top of that you can make pretty much anything with these balloons as they are lightweight and very easy to move. 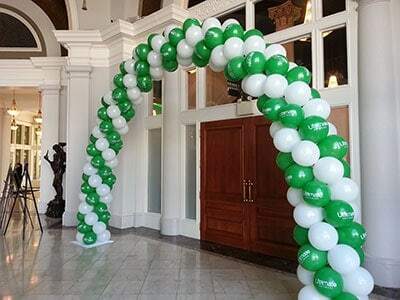 These beautiful arches and columns will attract the attention of any eye and as such are the perfect decoration to have at a corporate event. These balloons however do not only have to be used in decorations although that is a big part of their function. You can have separate top-printed balloons just to show off as well and maybe even to hand out. These will work like regular balloons except that the bottom won’t show, making the logo way more prominent. Finally, there is no environmental downside with these balloons or any of the CSA Balloons balloons as they are all made of 100% natural latex. This means once the balloons are disposed of they will biodegrade easily and will cause no damage at all to the environment. 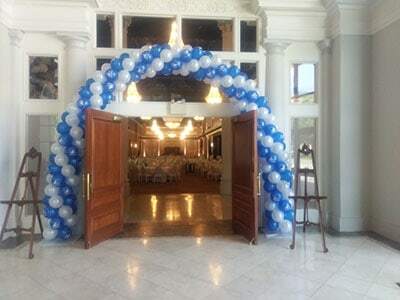 In conclusion the top-printed balloons are perfect for decorative purposes such as arches and columns and are also good just by themselves. On top of all that they are biodegradable and cause no harm to the environment. These are only some of the reasons why top-printed balloons are perfect for your corporate events so go order them today.